It's that time of year: If you're one of the hundreds of millions people on Ikea's mailing list, you probably recently received a thick square of super-thin paper filled with (mostly rendered) products. Ikea has been sending these babies out for more than six decades—and you can follow the evolution of popular design just by looking at them. With the help of Ikea's own copywriters, the committed Ikea fans over at HomeDesigning pulled together 63 years of Ikea catalog covers, dating back to the first catalog ever sent out in 1951. 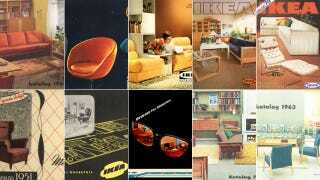 It's fascinating (and pretty hilarious, at moments) to see the classic Ikea tropes evolve over time. There was definitely a dark period in the late 1960s and early 70s, but just a few years later, Ikea had ditched the overstuffed pee-yellow couches for classic designs like its Alvar Aalto-inspired Poang chair, which is still with us today. Check out the covers below—or head over to their post for more.